McAfee Vulnerability Manager, with its McAfee Asset Manager feature, actively or passively canvases everything on your network. Now you can uncover devices hidden on your network as well as smartphones, tablets, and laptops that come and go between scheduled scans. What you haven't been seeing or scanning will surprise you — and could be jeopardizing your compliance. If it has an IP address or is using your network, Vulnerability Manager can discover and assess it, automatically or on a schedule, revealing the compliance of all assets on your network. Combines vulnerability, severity, and asset criticality information to quickly identify, rank, and address violations and vulnerabilities on networked systems and devices. Combines active and passive network discovery and monitoring to reveal virtualized, mobile and hidden devices on your network. 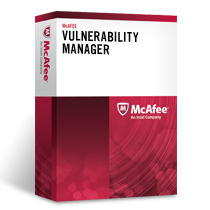 A major requirement of auditors is to prove that you're not vulnerable to threats, which is a significant attribute of McAfee Vulnerability Manager. Automatically ranks the risk potential of new threats by correlating events to your asset and vulnerability data. Defines values of policy checks and determines whether your organization complies with major regulations. Through an easy-to-use wizard it gives you templates for SOX, FISMA, HIPAA, PCI, and more. Categorizes data by asset or network, and uses powerful filters to select and organize results in your reports. You can even create reports while scans are running. Performs authenticated and unauthenticated checks, automatically updated 24/7 by McAfee Labs. This helps you delve deep into operating systems and network devices to find vulnerabilities and policy violations.